No Fear. Bow Down. Pray. The movement. Click on image to purchase poster! The 2016 Presidential election was deeply contentious and started a split in America in ways that modern society didn't think was even possible. Lines were split across political parties, race, sexual orientation, religion and economic lines. When we take a look at it, the root of discard is really fear. We often fear the unknown and if nothing else, the new administration has shifted the country into unknown territory. We have a decision to make. Will we put our faith in fear or in God. In 2018, We are still Moving In Faith Towards Our Purpose! No matter the side of the fence you are are on or who you voted for, we have a new President in America who is determined to shake things up. As he appears to make decisions that are outside of normal protocol and use social media as his primary form of controlled communication, many are increasingly fearful for their future and the future of the country. I have learned that the key to overcoming fear and worry is to exercise my faith in God. At the end of the day, we will be fine. As a daughter of Zion, my faith in God has sustained me even during the toughest times. I know that no matter what happens in the world, nothing happens that He does not allow or have a solution. At the end of the day, HE is in control. 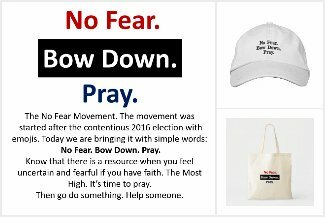 As I looked at the many protests that began to spread around the world post-presidential election, and continue to watch the fear across the faces of many, a quiet voice urged me to not be afraid, to humble myself, bow down and pray. God is in control (2 Chronicles 7:14). That phrase became sort of movement for me and the theme we adopted in 2017 and continuing in 2018; Moving in Faith Toward my Purpose. Last year, we focused on purpose and ways in which we can operate in it. For 2018, we are catapulting our momentum towards our purpose with our faith. Faith will not only move closer to our purpose, but will sustain us when we realize our full purpose. True faith maintains us during those times when we can't see our purpose (2 Cor. 5:7). This year, we will focus on our faith to drive us to act despite any fear; whether it's going after that new position, trying something we've never done before or starting that new blog or business idea. Whatever it is, we are moving towards our purpose and using our faith to fuel it. Our goal is to inspire and encourage our clients to be their very best. We offer a multitude of resources to move our clients closer to their purpose. Won't you join us? Get ready and get excited! We are moving forward toward our purpose this year! GET THE NO FEAR GEAR! 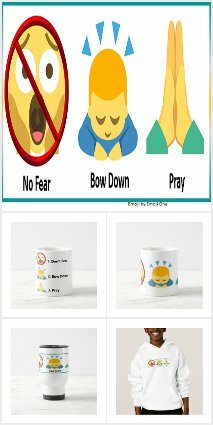 AT OUR NETKI_ENTERPRISES STORE ON ZAZZLE! No Fear. Bow Down. Pray. It's Simple. Emoji: No Fear. Bow Down. Pray.